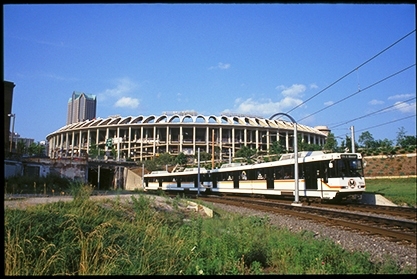 A MetroLink train approaches Busch Stadium in 1993. It was a year that gave us Beanie Babies and $1.16 gas; The World Wide Web and $4.14 movie tickets. Closer to home, 1993 was the year that MetroLink trains started operating in the St. Louis region. On July 31, 1993, a MetroLink train pulled out of the Union Station MetroLink Station, bringing light rail service to the area for the first time. It’s been a good two-decade run so far, with several expansions and strong ridership throughout. 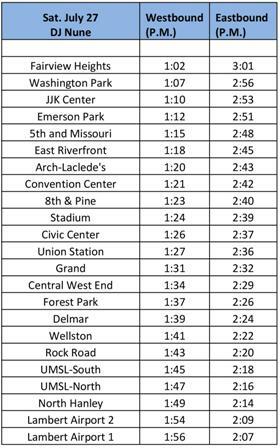 What opened as a single MetroLink line from North Hanley to East St. Louis has today grown to 37 stations stretching 46 miles. The system connects citizens traveling between Lambert-St. Louis International Airport; Shrewsbury, Missouri, downtown St. Louis and communities as far east as Scott Air Force Base near Shiloh, Illinois. Bi-State area residents rely on MetroLink for transportation to work, school, entertainment venues, health care facilities, and other important destinations across St. Louis City and County and St. Clair County. Those trips are reflected in the more than 17 million boardings a year. What: News conference to highlight the success and impact of MetroLink in the St. Louis region over the past two decades. When: Friday, July 26, 2013; 10:30 a.m.
Who: Speakers will include John Nations, Bi-State Development Agency/Metro President & CEO; Charlie Dooley, St. Louis County Executive; Mark Kern, St. Clair County Board Chairman; Charles Bryson for St. Louis Mayor Francis Slay, and former Congressman Jerry Costello. Also in attendance will be members of the Bi-State Development Agency’s Board of Commissioners, current and former MetroLink employees and other guests in addition to the general public. The 1990s tribute band, The VCRs will perform at the Scott Avenue Transit Plaza, entertaining the crowd before and after the event. From 3 p.m. to 6 p.m., volunteer Metro Ambassadors will hand out MetroLink 20th anniversary commemorative paper banks to customers at various MetroLink Stations in Missouri and Illinois. 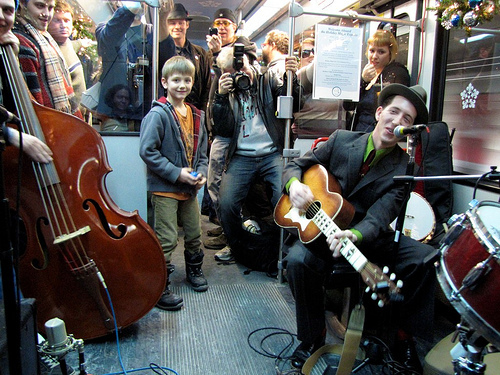 Pokey LaFarge plays onboard MetroLink in 2010. The anniversary celebration continues with two hours of live music on a special MetroLink train on Saturday, July 27 and on Sunday, July 28. 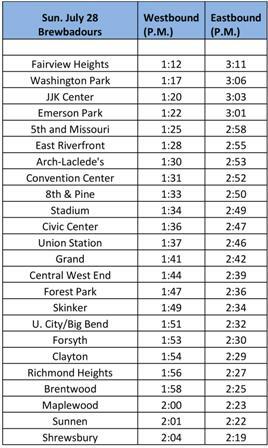 DJ Nune will perform on the MetroLink Red Line on Saturday starting at the Fairview Heights Station at 1:02 p.m. to the North Hanley Station and back to Fairview Heights. 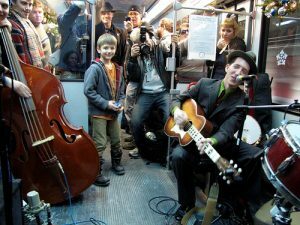 The Brewbadours will perform on the Blue Line beginning at Fairview Heights at 1:12 p.m. to the Shrewsbury Station and back to Fairview Heights. Regular Metro passes or tickets are required to ride MetroLink during the concerts. Metro Ambassadors will also hand out the special MetroLink 20th anniversary paper banks on the train during both weekend concerts.